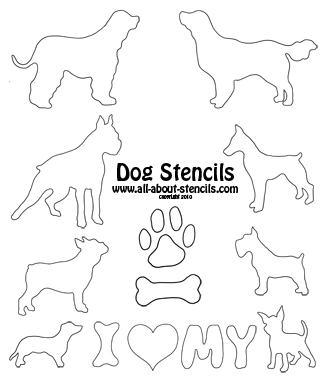 You must be a dog lover so I know you’ll go barking mad for these free dog stencils with breed variety and don’t miss the Cartoon Doggie below! Man’s best friend! You just gotta love ‘em. And they come in so many different sizes and personalities that there’s one for everyone. When there’s a request for an animal stencils this is most likely the one. Like I always say, if you want unconditional love, get a dog! When you think about the years of love and pleasure they give us how can you help but want to surround yourself with everything to do with them? Alright since I mentioned bookmarks I have to tell you my neatest gift trick. Paint your dog stencil on a thick piece of paper. 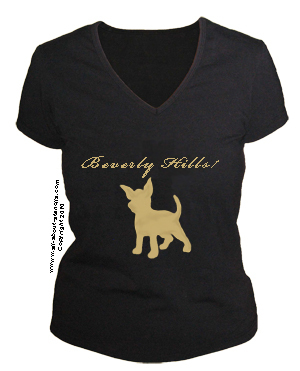 You can use the specific dog breed with the “I Luv My” text or dog bone or paw print - just mix it all up. Write the dog’s name and some other personal sentiment. Then cut it out in the shape of the book mark and laminate with a strip of clear packing tape on each side. Trim it out and woof - you’re done. You could even trim it with some of those cute craft scissors that have the scalloped edge. They are so cute and my friends love them. I hang them from gift bags instead of ribbons. If you love ‘em, flaunt ‘em! It’s easy to make cute t’s like this one and it makes for a very fun project too. You can even do this with old t shirts you are ready to throw out and give ‘em a few more years. You could make one of these for a friend as a gift. That would be much appreciated. For more about stenciling on fabrics check out How to Garment Stenciling. That’s where you learn more about making a project like this a howling success! Oh yeah - I hate to mention it but the cat asked me to tell you that just in case you’re interested there’s a few cat stencils too. Working with paper stencils like these free dog stencils has a few advantages. You can adjust the size of your paper stencil to fit the size of your project. Just take the page to a copier and reduce or enlarge. Then cut out the stencil openings. It's that easy and you can’t do that with a plastic stencil. You might even have the option to change the size when you print (look on your printer options - it may want a percentage of size to print). Well, there are so many breeds of dogs that I couldn’t put them all here. 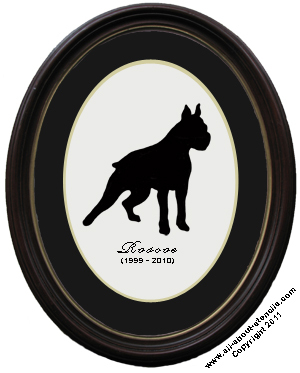 I’m working on a book that I hope to publish soon with many, many more breed specific stencils. 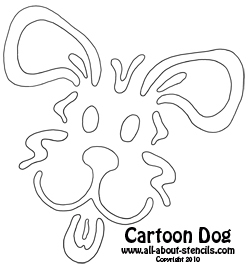 In the meantime, if you didn’t see the likeness of your best friend here or you have a beloved mutt (like my two) than maybe this cartoon puppy will fit into your stencil art. I hope so! In fact, this site has so many cool stencils and project ideas I’m sure you’ll always find something to tap your interests. Here's a great idea to honor those pals of ours that have gone to the Rainbow Bridge. Designed a piece of framed art with his likeness, name and dates. Of course, you can do this for the little ones still here - just forget the dates. Are you new to working with free printable stencils like these? If so (or even if not) you should know that you can prepare your paper stencils so that they can be used again and again. Yeah! That’s right. The one you just printed can become a long term free stencil. It’s easy. Do you have some of that clear, wide packing tape? Just use it to run even strips covering all of the paper surfaces before you cut out the stencil. Burnish or rub the tape down to get the air pockets out. That’s it. For more on working with paper stencils like these dog stencils see our article on Stencil Downloads. If you think you’re going to become a downloadable stencil fanatic then get yourself some clear shelf liner paper to cover your stencils before cutting them out. It’s so much easier and it’s really not expensive at all. You’ll love the ease this provides. Hey! Don’t forget that I (and everyone else) want to see what you have done with your dog stencils. Just click on Stenciling Projects to get your masterpiece showcased here on this web site. Won’t that be exciting! Or if you have any questions or want to share information join in on the Stencil Blog. Well, I hope to hear from you soon. P.S. We are thrilled to introduce our selection of Stencil Designs. Instant gratification at its finest! You don't need a special printer - these designs are specially formatted to print straight from your home computer on standard letter sized paper. Once downloaded, you will have your complete stencil booklet with patterns and instructions. Just click, buy and print! Wait! Wait! Here's that project ideas video I promised you. You can get the pattern free at Dolphin Stencil. The idea is that you can do this same project with any of the dog stencils above. Enjoy! Return to Home Page from Dog Stencils. Return to Animal Stencil from Dog Stencils.